Tuesday, August 30, 2016 (New York, NY) – Producers Stage Entertainment USA, Bill Taylor (Sister Act, Rocky) and Tom Kirdahy (It’s Only A Play, The Visit) today unveil the artwork for the new musical, ANASTASIA, which will begin previews on March 23, 2017 and open on Broadway on April 24, 2017 at the Broadhurst Theatre (235 West 44th Street). The new musical reunites the Tony Award-winning writers of the Broadway classic Ragtime: book writer Terrence McNally, composer Stephen Flaherty, and lyricist Lynn Ahrens. Anastasia features direction by Darko Tresnjak, Tony Award winner for Best Direction of a Musical for A Gentleman’s Guide to Love and Murder and choreography by Peggy Hickey. The company of ANASTASIA will be led by Christy Altomare as Anya, Derek Klena as Dmitry, John Bolton as Vlad Popov and Caroline O’Connor as Countess Lily Malevsky-Malevitch. Additional casting will be announced soon. The creative team also includes Alexander Dodge (Set Design), Linda Cho (Costume Design), Donald Holder (Lighting Design), Peter Hylenski (Sound Design), Aaron Rhyne (Projection Design), Charles LaPointe (Hair/Wig Design), Tom Murray (Music Supervision & Direction), Doug Besterman (Orchestrations), casting by Telsey + Company/Craig Burns, CSA. The musical recently completed a sold-out, record breaking world premiere engagement at Hartford Stage in CT.
From the twilight of the Russian Empire to the euphoria of Paris in the 1920s, the new musical, ANASTASIA, is the romantic, adventure-filled story of a brave young woman attempting to discover the mystery of her past. The new musical is inspired by the Twentieth Century Fox Motion Pictures. 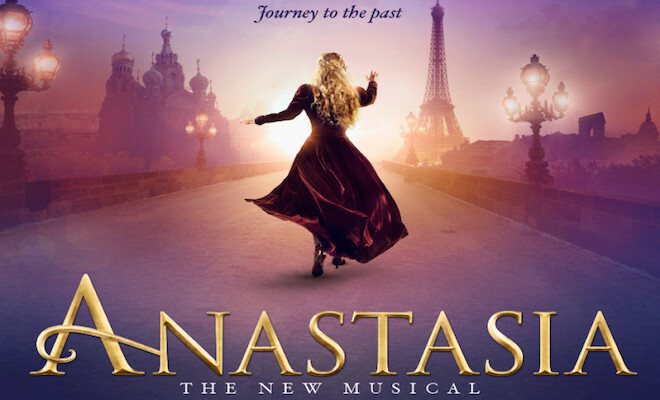 ANASTASIA features beloved songs from the 1997 film, including Ahrens and Flaherty’s Oscar-nominated “Journey to the Past,” as well as an entirely new score from the Tony Award-winning team. Tickets will go on sale in Fall 2016. Group tickets are now on sale. For more information, visit www.anastasiabroadway.com or call 800-432-7780.